Expand your market by selling internationally and to domestic consumers by simply offering more payments options. 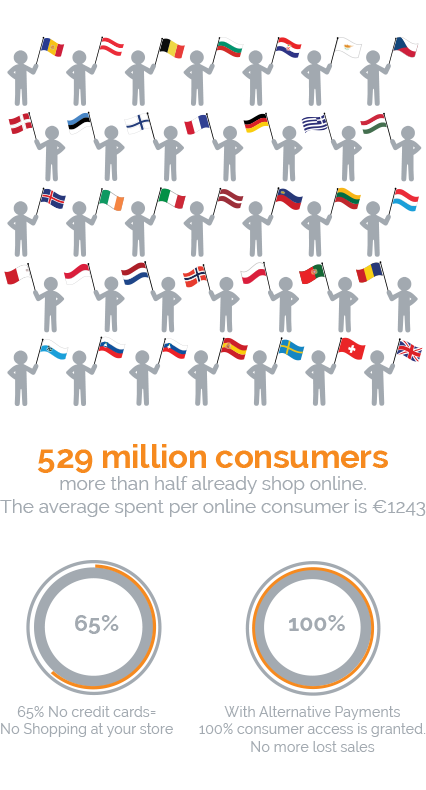 The European Union is the second largest e-commerce marketplace in the world, after Asia-Pacific. Many of the EU countries have higher rates of internet usage than the US. The B2C market in EU is projected to be as much as €625 billion by 2019. Merchants further benefit from the GEO-IP service that is included, which automatically provides the payment pages in the consumer’s native language. Also, local support phone numbers and email addresses for customer support are posted to manage consumer inquiries. EuroDebit®/SEPA easily integrates with any existing billing platform and all of the 2000Charge services include access to secure admin pages with detailed reports and features such as fraud scrubbing, age, and/or address verification, and recurring billing options. For more details please visit our EuroDebit®/SEPA Product website. Start accepting EuroDebit SEPA today! Reach 520 million consumers with a single payment option and increase your payment coverage! No EU bank account needed! TM & © 1999-2017 2000Charge Inc. All rights reserved.